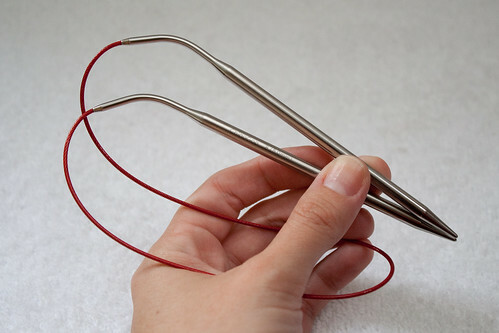 Recently, I’ve mentioned that I’ve tried out the new ChiaoGoo RED Stainless Steel Circulars. I’ve had a few people ask what I think about them, so I thought I’d do a little review. ChiaoGoo RED Needles – Original on the left, Lace on the right. 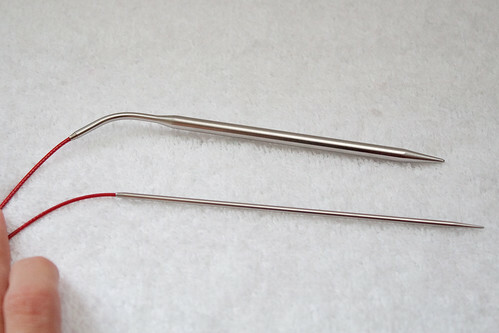 There are two types of ChiaoGoo RED Stainless Steel Circulars: original and lace. Initially I bought the original in US 8’s in a 24″ and 40″ circular since I wanted to use them for Eadon. I bought those from Grandma’s Hand Knitting on Etsy. They are relatively inexpensive (similar in price to HyaHya Stainless Steel circulars) and they arrived within a few days of ordering. The cable is the most unique I’ve ever seen in any knitting needle to date. It reminds me of the type of cable you’d use to lock up your bicycle with. The cable has no memory at all, unlike the plastic that most circulars use which have to be stretched out or used to lose some of the memory it has from being packaged. Straight out of the package the cable can be straightened easily. The size is printed lightly on the side, which you can kind of see in the picture below if you look closely at the bottom needle. 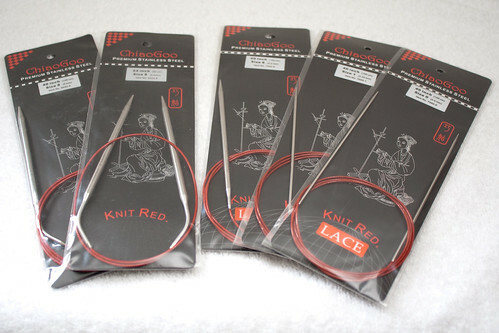 Later, when I placed an order at The Loopy Ewe, I decided to order a few of the ChiaoGoo RED Stainless Steel Lace Circulars. I ordered a US 0, US 1, and US 6, all in the 40″ size. The original tips are the same as their Stainless Steel Circulars which have now been discontinued. The biggest difference between the original and the lace is that the original has a bend at the base of the tip near where it joins the cable. The other difference between the two is that the lace tips are sharper. I’d say that the lace are similar in sharpness to the Addi Lace needles. As for the sharpness of the originals, I’d compare them to Knit Picks Nickel circulars or HyaHya Stainless Steel circulars. Not as sharp as Addi Lace, but not dull like Addi Turbos are. Here are the Original and Lace needles side by side. I like both the Original and Lace ChiaoGoo RED needles. The bend at the base of the Original ones don’t bother me at all, but a knitter I know who has a few of the ChiaoGoo RED needles said she doesn’t care for the bend in the Originals. I like that the Lace are pointy which are great for, well, lace! The Originals are nice to knit with, I like the bend, and they aren’t too dull (not a fan of Addi Turbos personally – too dull). While I like both the Original and Lace needles, I really do not like these needles for magic loop. I know there are knitters out there that have said they use them for magic looping socks, but I am just not at all a fan. I bought the US 1’s and US 0’s for magic looping socks. I tried it and frankly, I hated it. For reference I use Knit Picks Nickel needles for magic looping socks right now. Their cable does have a curl in it. It just stays out of my way by curling down and away from me. The ChiaoGoo RED needles twisted a bunch, curled a bit up, curled a bit towards me, and just generally got in my way. The cable got in my way so often that I felt like I was fussing with it constantly instead of knitting! I had to switch back to my trusty Knit Picks needles. I will give them another try sometime for magic looping socks, but I just wasn’t that fond of them. Overall, I’d recommend that you give these needles a try. If you like HyaHya Stainless Steel or Knit Picks Nickel or Addi Lace needles, I’d recommend giving these a try. They’re great needles for a good price with a very unique cable! That’s interesting about the cable issue with Magic Loop. I bought two of the lace needles last weekend, and absolutely LOVE them for straight knitting. Haven’t tried them for Magic Loop, but maybe I’ll keep the few sets of Addi Lace for that. Thanks for pointing that out. Addi’s are just so ridiculously expensive. It’s nice to see good needles that are affordable! Interesting! Thanks for sharing! I’m going to have to get myself a set or 2 to try!